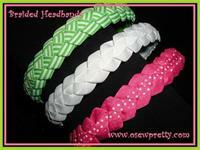 "My Daughter just loves your headbands. Well now she has a matching headbands for her Doll. What a great idea! They make great gifts for her friends too!. 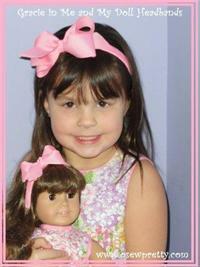 Gracie and her Doll are cute as a button in there matching boutque style headbands. 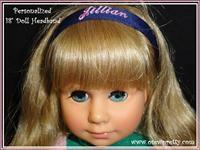 Design your own personalized headband to match her 18" doll clothing. Every doll should look just as cute as the girl who loves her! Choose from any of our gingham check ribbon to create your custom look. Cute as a button and practical to boot! 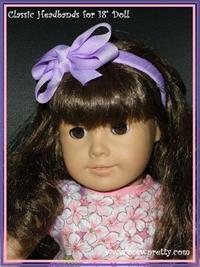 A ribbon wrapped headbands for her 18" doll. Our original and very stylish headband is hand woven in the U.S.A from your choice of any solid, stripe or pin dot ribbon colors.